Brown onions, garlic in olive oil. Add Fava beans and beer. This dish should be saucy therefore add water if needed. Note: if you make this dish with "dry favas" you should pre-soak favas over night and cook them just a you do with dry kidney beans. You will also need to use more water in order to get the saucy consistency of the "Favas Guizadas." 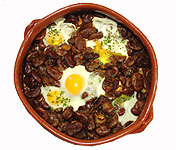 Remember to visit portuguesefood.com as we sell all the ingredients necessary for this dish.